The JOOLA North American Teams Table Tennis Championships is an annual competition, bringing together over 200 teams totaling nearly 1000 players from all around the world to compete for $20,000 in prize money. The event uses approximately 150 tables, 2,000 table tennis balls, and 150,000 square feet of the Baltimore Convention Center. It has been an annual event in Baltimore, Maryland since 1998 and is often referred to as the biggest table tennis tournament in the world! The 2011 JOOLA North American Teams Table Tennis Championships is a teams based competition where each team consists of three to five players. The teams are separated into divisions based on their average rating and results during the preliminary rounds on the first day. On the second and third day, teams battle other teams in their division in an effort to be the champion of their respective divisions! 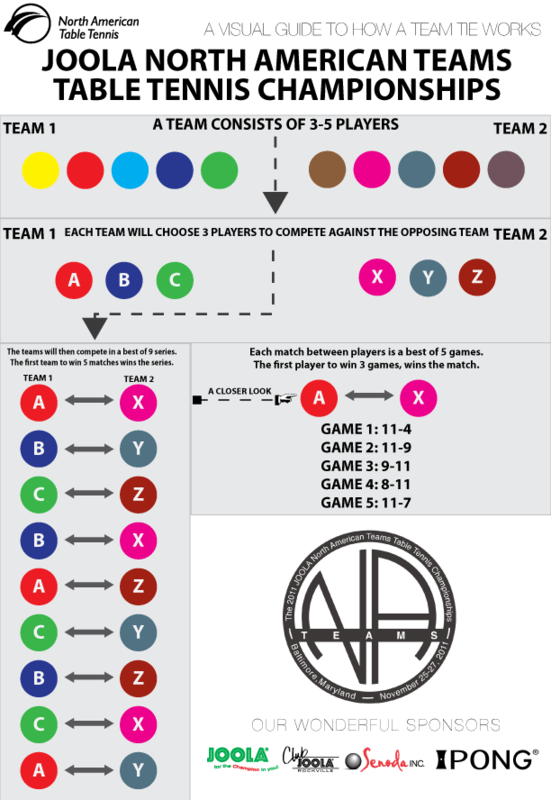 Here is a visual guide to help you understand how the a team tie would work. With entries from around the world, the JOOLA Teams Championship attracts a very competitive field . For some of our most skilled players, the Teams is their first American appearance. While we rely on information gathered from their International matches, trying to forecast their performance here can be difficult! Will they be able to reach the Championship? We play the matches to find the answer. Here are the known top contenders for the $10,000 first place prize in the Elite Division. Sponsored by the online Table Tennis retailer, members of this elite squad are all making their first American appearances. Fang Bo, undefeated at the 2009 World Junior Championship, joins with Zhang Chao (7 wins/4 losses at the 2010 Chinese National Championship) and Team Captain Song, the most internationally experienced member of the trio. Young, well-conditioned and at the top of their games, this World-Class entry will be tough to beat! Manufacturer JOOLA sponsors this experienced team of Internationals. Liu, now of Argentina, has been a fixture in the French Super League for decades, still was 4-1 at August’s Pro Tour Chile, dropping only a tough 7 gamer to Chuang of Taiwan. Also, he just recently won the 2011 Pan American Games! Lin Ju, representing the Dominican Republic, had a short visit to the 2011 Worlds thanks to a tough draw, one match with Wang Hao. Pistej has played 11 ITTF events this year, most recently notching a win against Fillimon at The European Union Teams. Experienced and wily, this crew of veterans has come to win. New York Athletic Club again supports the entry of Team Captain and six-time US Men’s Singles Champion David Zhuang. Is there strength in numbers? California’s Wei Wang (undefeated here last year!) and New York’s Gao Yan Jun, hook up with Eastern Open Champion Xun Zeng and Ting Sun, now coaching in Maryland, to test the theory. the planet. Li, Geng and YuFei played here in 2009 with great success and are back for more, with newcomer (to America at least!) Xinyun Xiong. This entry is noted for smart play, excellent coaching and an outstanding work ethic. Expect them to exploit their opponent’s most uncomfortable weaknesses. Can the whole be greater than the sum of the parts? There couldn’t be a greater contrast in styles between the female at the table quick-hitter Zheng and her teammate, backcourt counter-looper Barney Reed. Joined by newcomer Wei Xia Ji and Captained by Californian Wei Wong, SUMMUS looks to capture a winning synergy. Lily Yip Table Tennis Center in New Jersey is an ITTF hotspot, so it’s appropriate their entry has an International flavor. Hugh and Xiao are both top US Men, joined here by Wang Yu Tian, given an estimated rating of 2700 for his first American appearance. Will these three be able to crack the upper echelon? That’s why we play the matches! This entry was posted in 2011, News, North American Teams, Tournaments. Bookmark the permalink.